The UNO Gas Exhaust Unit can be connected to a central exhaust system to expose of any exhauled or non used anesthetic gasses. When such a system is not available the gas exhaust unit can be connected to adsorbtion filters. We have two types of these filter in our program. This small canister can be connected to the UNO Gas Exhaust Unit. The activated charcoal will adsorb the isoflurane left in the exhailed flow. After each use the canister has to be weight and after the weight has increased with 200 grams the canister has to be replaced by a new one. This patented Contrafluran Anesthetic Scavenging Filter contains solid materials with a rugged grain structure, extensive surface area and high micro-porosity. This structure adsorbs efficiently and retains anesthetic gas components selectively from the exhailed- or un used anesthetic gas as it passed through the filter. This Contrafluran filter has a storage capacity of approx. 400 gr. and is to be returned after use to UNO for environment friendly disposal of the adsorbed anesthetic gasses. 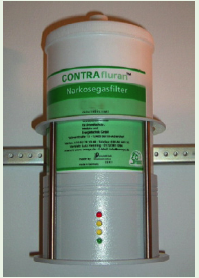 The differently coloured LED'S (Geen, Yellow, Red) of the control unit indicate the quality of the filtered expired gas and thus the fill level of the filter. LED The filter cleans the expired gas and has still sufficient free capacity. LED The capacity of the filter is exhausted. The used filter must be replaced by a new one. Download the PDF on this item here! The fill-level-control-unit has to be serviced annually!